First the Skin Renewal Scrub gently buffs away dullness leaving skin ready to drink in the Effervescent Soak, a luxurious silky emollient and mineral rich hand bath. The, the clinically prove Rejuvenating Serum begins to erase visible signs of aging on the hands. the ultimate final is the Finishing Butter, a silky, soothing massage and finishing butter that protects in sunscreen while enveloping skin in a veil of velvet. The ultimate pedicure service cleanses, renews and restores the spirit and mind as well as the feet. 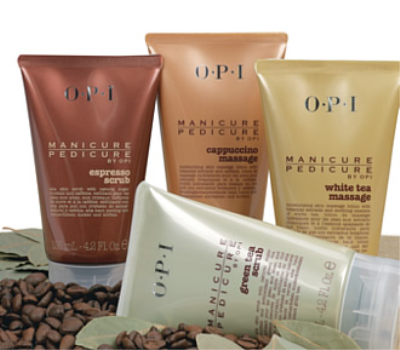 Pedicure by OPI is a range of essential professional products that transform ordinary pedicures into an extraordinary spa experience. Containing exotic ingredients like green tea extract, avocado juice, grapefruit extract, vitamin A and E and tea tree oil. A new generation of sole soothing products that refresh and reenergize, while setting your feet on the path to perfection.And for the ultimate in lacquer, go with the wide range of Lacquers by OPI nail lacquers, over 36 colors with exciting names like melon of troy, OPI red, holy pink Pagoda and many more.